Expansion plans by two engineering firms could create 820 new jobs in Scotland's renewable energy sector. Korean firm Doosan Power Systems is to locate a research centre in Renfrew employing up to 200 people. It also wants to build a manufacturing plant in Scotland, creating up to 500 direct jobs and 1,000 supply-side jobs. Renfrew-based Steel Engineering aims to double its 120 staff by opening a new plant and building a mini-port for ships on the River Clyde. It's taken a lot of huffing and puffing, but at last the economic wind turbine is turning. And it looks good for Clydeside that it has attracted four large multi-national firms to locate key bases there. Mitsubishi and Scottish & Southern Energy have a joint centre for engineering excellence in Glasgow, Iberdrola has opted to put its international renewables planning centre near its ScottishPower subsidiary. Also from Spain, Gamesa has opted for Glasgow as a research base, while looking at Dundee for manufacturing and logistic support. The biggest commitment so far is from Doosan Power Systems, a subsidiary of the vast Doosan conglomerate based in South Korea. It is new into the wind turbine business, though it's not new to green energy research, as a partner with Scottish & Southern Energy on early stages of commercialising carbon capture and storage. The research and development centre comes first, with 500 jobs to follow in a turbine manufacturing plant. So far Scotland's only had one such plant, near Campbeltown, and it's had a troubled couple of years, with three owners. So Doosan's statement of intent is a sign that the green jobs potential and hopes may be moving towards reality. The jobs announcements were made by both companies, who were visited by First Minister Alex Salmond. Doosan intends to locate its research and development centre for renewables at its current site at Westway in Renfrew, creating up to 200 jobs. The Korean firm is also in talks with the business development agency, Scottish Enterprise, to set up manufacturing and assembly facilities in Scotland - its favoured location for wind turbine development and production. 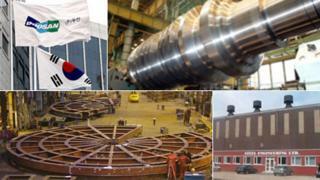 Doosan expects its offshore wind plans in Scotland to create up to 1,700 new jobs. The firm aims to directly recruit about 700 new staff, with a further 1,000 employed in associated supply companies. In a separate announcement, Steel Engineering, which is also based at Westway in Renfrew, said it aimed to create 120 jobs by expanding its business servicing a range of clean energy sectors, including offshore wind, wave and tidal power. The firm is getting a £1.8m government grant towards the £3m investment. Steel Engineering is also in talks with Skills Development Scotland about developing a training school with Anniesland College in Glasgow. This would aim to provide training tailored to the latest fabrication techniques, and welding procedures required by the renewables industry. Mr Salmond said both announcements were "great news for Renfrew and for the wider Scottish economy". He described the Doosan initiatives as "another great stride forward for the renewables industry in Scotland - which is now the chosen destination for three energy engineering giants to design their next generation of turbines to service the global offshore wind industry". The first minister added: "Scotland also plays a key role in the energy industry supply chain and Steel Engineering are an excellent example of how Scottish companies with great experience servicing the offshore oil and gas industry have been building the renewables side of their business."